The United States Congress designated the Bradwell Bay Wilderness (map) in 1975 and it now has a total of 24,222 acres. All of this wilderness is located in Florida and is managed by the Forest Service. A swamp thick with titi trees, distinguished by their leathery leaves and fragrant white flowers, dominates the second largest Wilderness in Florida. Here, you'll also find a swampland of hardwoods or pine-titi mixtures and small ponds that are either open or covered with aquatic plants. The climate is subtropical, and rainfall averages 55 inches per year. Summers are hot and sticky with humidity, but temperatures have been known to drop into the teens come winter. Bradwell Bay's low areas are generally submerged beneath one to four inches of standing water. The water table lies close to, if not above, ground surface over most of this flat Wilderness. Drier islands of longleaf pine and wire grass border parts of the swamp. White-tailed deer, black bears, and alligators top the food chain. With sufficient rainfall, canoeists can run the Sopchoppy River, which defines the eastern edge of the area. Hikers can follow old logging roadbeds or take the east-west Florida National Scenic Trail through Bradwell Bay. Truth is, however, that hikers who opt to use the well-marked trail typically end up wading through sections of waist-deep water. 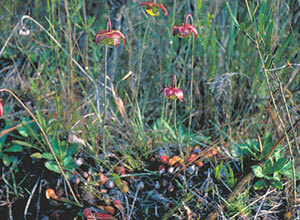 Planning to Visit the Bradwell Bay Wilderness? How to follow the seven standard Leave No Trace principles differs in different parts of the country (desert vs. Rocky Mountains). Click on any of the principles listed below to learn more about how they apply in the Bradwell Bay Wilderness.